The old expression ‘beer before wine and you’ll feel fine; wine before beer and you’ll feel queer’ is a myth, scientists have said. Folk wisdom such as ‘grape or grain, but never the twain’ exists in several languages – but experts have said there is no truth in it. Instead, drinkers should pay attention to red flags while drinking to save themselves feeling sick the next day. 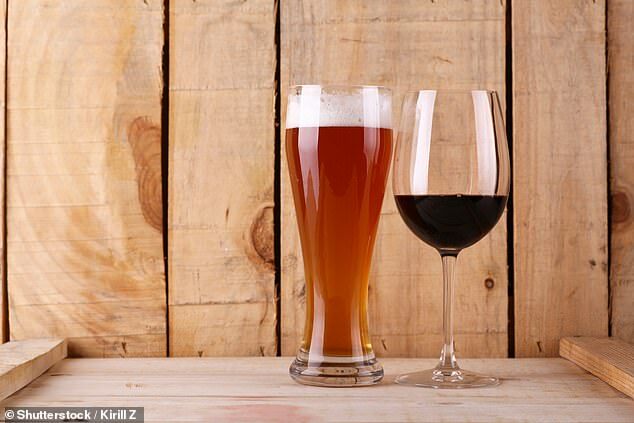 Researchers gave alcoholic drinks to 90 volunteers to discover whether the combination of beer and wine consumption could affect ‘hangover intensity’. Volunteers were split into three groups, with the first drinking around two and a half pints of beer followed by four large glasses of white wine. The second group had the same amount of alcohol but in reverse order, and subjects in the third, control group had either only beer or only wine. Participants were asked about their hangover the following day and given a score on a so-called Acute Hangover Scale, based on factors including thirst, fatigue, headache, dizziness, nausea, stomach ache, increased heart rate and loss of appetite. The volunteers, aged between 19 and 40, were asked about their well being at regular intervals and kept under medical supervision overnight. The findings indicated that no matter how you order your drinks, if you drink too much you are still likely to be ill.